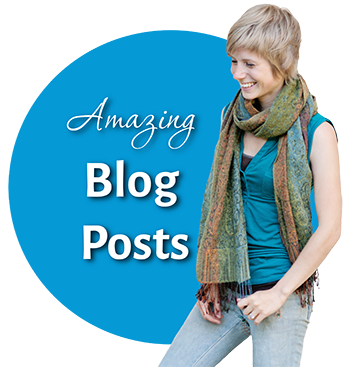 Today we welcome a guest story from Domh, sharing her success with The Love Vitamin method! Right around puberty is when the acne started. I would have the occasional spot on my chin, cheek, near my nose, etc…but the worst of it was the countless, tiny bumps all over my forehead. No over-the-counter methods worked, so when I was 12 we went to the dermatologist. I went on an oral prescription, tetracycline, and a prescription topical cream. I also got rid of my bangs. The bumps cleared up, but I still had the odd zit here and there, as one does when they are a teen! Fast forward seven years, I go on birth control, get married, and begin “adulting”. My skin stayed pretty clear, even when I got off of birth control. My skin has always been what I would call combination… cheeks completely fine, but the T-zone and chin were always greasy by the end of the day. But still, it just wasn’t a problem acne-wise. In fact, I would often be complimented on my “beautiful skin”, or my “ivory complexion”. Clear skin was a part of my identity. At that point, my regular routine included an anti-acne exfoliant in the morning, and then a gentle cleanser to remove makeup at night, toner, and moisturizer. Years without a major incident. And then… something happened. 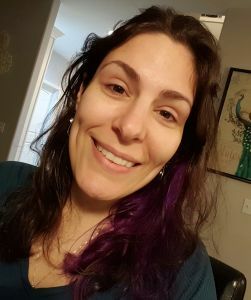 It crept up slowly, but a few months after my 30th birthday, I realized the bumps that had tormented me in my pre-teen and early teen years had returned! I tried using over the counter solutions again. I ordered a skincare regimen online that was touted as being “better than Proactiv”. It worked for about three weeks, and then the bumps returned with a vengeance. So, then I tried Proactiv+. Three weeks, it worked! … until it didn’t. But… but…. the thing is… I’m a dancer! I am up on stage, supposed to be representing some kind of beauty! My confidence was suffering. If I didn’t have my beautiful skin, then what was left? I mean, don’t get me wrong… I’m great at doing corrective makeup, but that’s no way to go through life. In the evenings, as I would get ready for bed, I would just stare at my bumpy forehead and cry. I just didn’t know what to do…I was afraid I would have to go to a dermatologist again, and I knew I couldn’t really afford that. 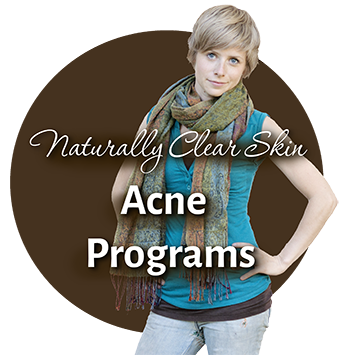 Instead, I went on google in late December of 2015… I think the search terms I used were “natural acne cure”, and BOOM. There was the Love Vitamin. I signed up for Tracy’s newsletter, received my free report, and began to read. It seemed too simple! I ordered all of the recommended products: the probiotic, the DIM, a honey cleanser, and jojoba oil. For the days leading up to their arrival, I had done further reading and was doing a modified Caveman regimen—i.e. I was washing my face still, but only at night to remove makeup…and even that little bit made a difference. Once all of my new tools arrived, I started taking my supplements, and still only washed my face once per day before bed, moisturizing morning and night with a few drops of jojoba. Then, the headaches started. Long story short, I went back to the Love Vitamin to search side effects of using DIM, and indeed others had experienced the same thing! So, I bought the Thorne Liver support supplement and began to take that at the same time as my DIM… voila! No more headaches. (Note: I’m not really surprised about the headaches… my husband is a winemaker, so I partake more often than most folks). 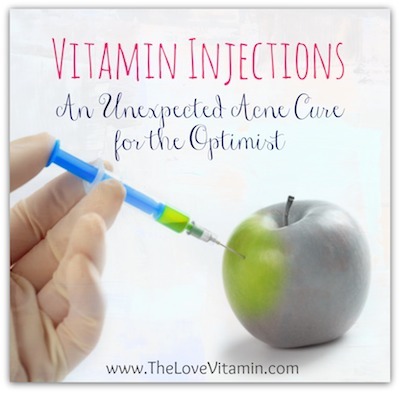 Within a month of starting The Love Vitamin, I could run my fingers over my forehead and nearly all of the little papule bumps had gone. I started getting compliments on my complexion again… I’ve even heard that my skin “glows”. My daily makeup routine involves under-eye concealer, a light dusting of powder (which I make myself), eyebrow grooming, and mascara… eyeliner if I’m feeling fancy. Before, I would have full foundation and extra concealer on all day every day. I still have to do a full face of stage makeup for performances, but that’s okay… it’s only once a month. 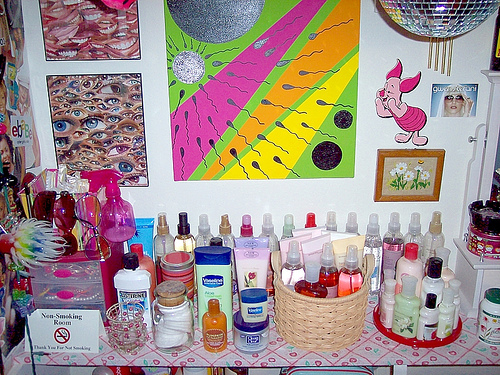 Needless to say, I threw out ALL of my other face creams and acne treatments. It’s been a whole year since starting The Love Vitamin and my clear skin is still going strong. I don’t even need the DIM anymore! The best part is that I don’t cringe and tear up at the sight of my face in the mirror anymore. I finally look and feel like myself again! 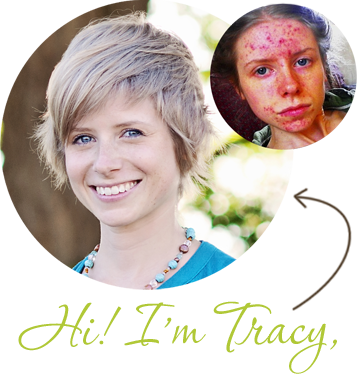 Are you like Domh and tired of acne making you feel second rate? Start taking your skin to the next level right now by getting my free report “7 Things You Can Start Doing Right Now to Clear Your Skin“! Dohm, I always love hearing success stories, and yours was no exception! It’s amazing how using fewer products can actually make your skin better. Also amazing that supporting it from the inside is so important. You look great, and I’m sure you feel even better! Great story! I love hearing these! I have the same problem with the little bumps on my forehead. I’ve been trying to eat healthier i. e. cut out most sugar, dairy, and white breads. I’ve been going to bed earlier and only wash my face with honey and jojoba oil! I don’t know what else to do! I’d love to hear how you make your powder though!